When an avalanche hit Mount Everest in 2014, Sherpa Dawa Tashi was the only survivor as his friends were buried in the snow. 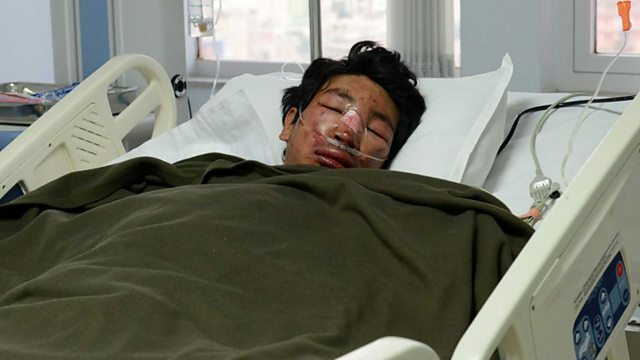 Dawa Tashi Sherpa was with a group of sherpas on Mount Everest in 2014 when disaster struck. An enormous block of ice had come loose and hurtled down the mountain. He was the only survivor as his friends were buried in the snow. You have ten minutes to pitch to Hollywood film director, Steven Spielberg, what do you wear? When British writer Matt Charman found himself on the phone to the movie heavyweight, he was just in his underwear. Fortunately Spielberg liked the story and Charman then wrote the screenplay to the director's last film 'Bridge of Spies'. For Alan Eustace, the most important moment in his life took place in a rather different outfit. When he made a supersonic leap from 41-thousand metres in the stratosphere, he made a world record for the highest altitude freefall jump. And hear from the Kenyan community where older members of the community have just started school.